The idea of good weather is so intoxicating. It doesn’t matter which part of the world you are in – whether it is hot most of the year, or it never really warms up, or if you have to go through a grueling winter to enjoy the summer sun! It truly doesn’t matter . – The idea of good weather makes you want to go out, grab ice-cream, roll down the windows and take a long drive, pack your bags and take impromptu trips. So when T.J.Maxx, reached out asking if I’d like to curate some summer getaway essentials from their website? 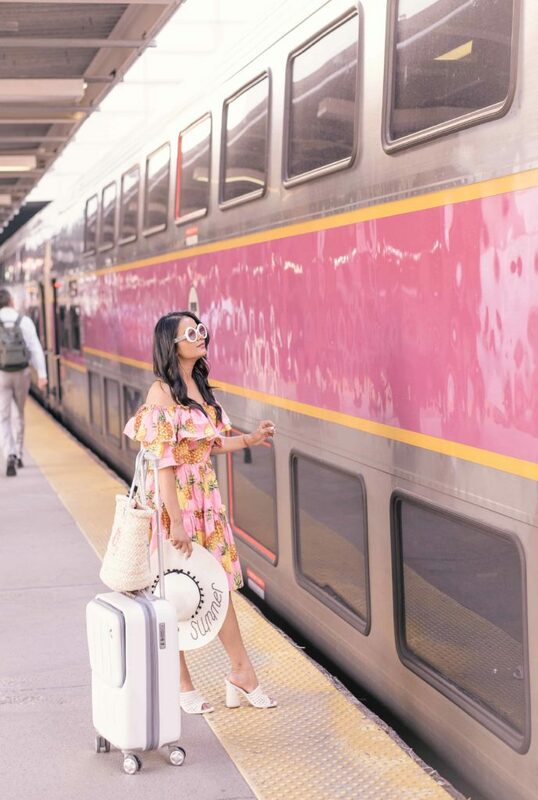 My response – Getaway essentials from TJMaxx.com? – ABSOLUTELY!!. Quick raise of hands, did you know that T.J.Maxx also has a website? I came to know about it not too long ago myself and have been loving sIsn’t that a treat for online shoppers ? 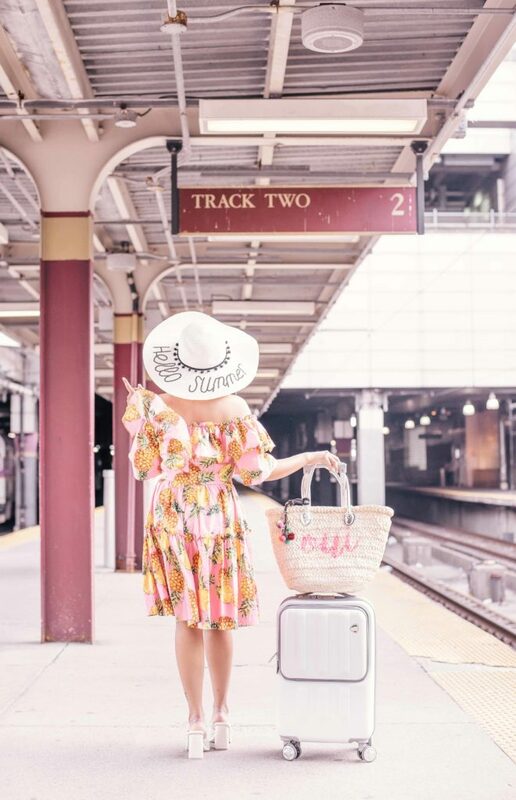 Just like the T.J.Maxx stores that we have all come to love, tjmaxx.com offers women’s, men’s & kids’ fashion & accessories, women’s shoes, beauty products, home décor, and so much more at an amazing value! Statement luggage pieces are having a moment right now. 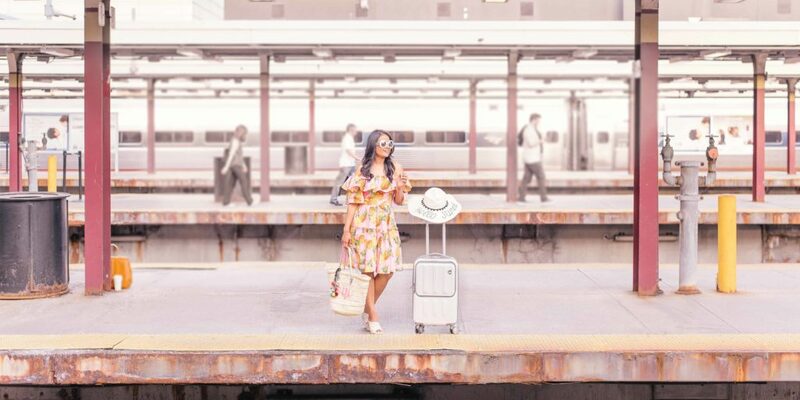 Colorful, metallic, neutrals – chic and sturdy – everything you need to make your travel style stand out. This hardside spinner suitcase in white is beautiful and perfect as a carry-on suitcase. Also not too heavy which gives you a few bonus pounds to stuff in. win-win! There are so many, I mean SO many dresses on tjmaxx.com, plus there’s a variety of styles at various price points. If there’s something you like while browsing online, grab it! Because similar to their stores, there is an ever-changing selection of treasures on site, and chances are that the item that you love will go soon. 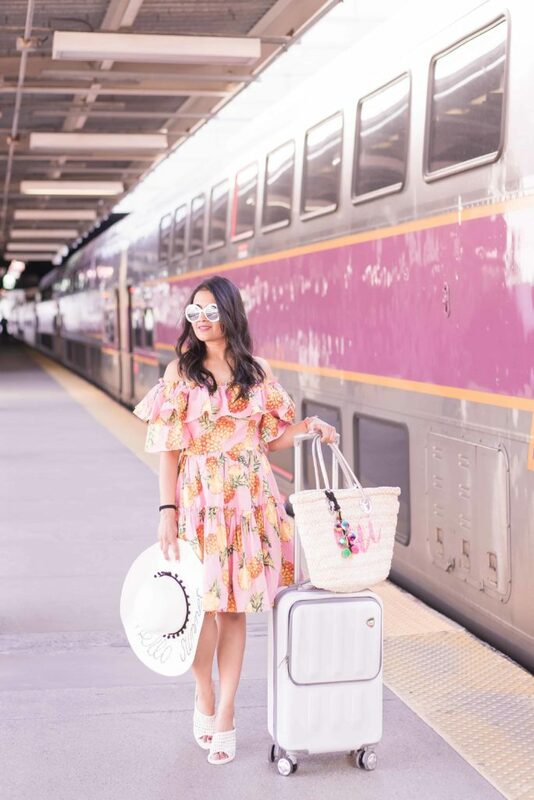 No matter what occasion or where you are headed this summer or even if you’re just having a relaxing staycation – there are casual and dressy outfits options to choose from. 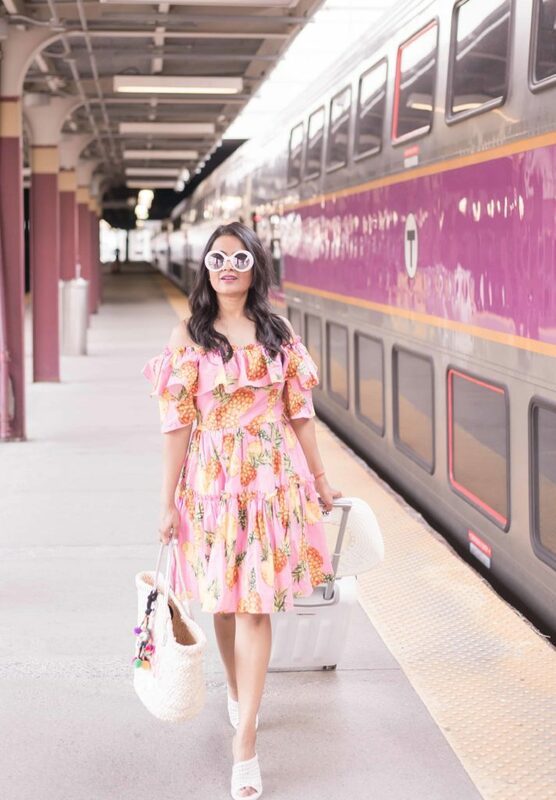 I couldn’t resist this adorable off the shoulder option, even if you don’t have a vacation planned, pop on this dress and you’ll immediately feel like you’ve been whisked away to a tropical island. No look is complete without accessories and there are plenty on tjmaxx.com that will easily fill up your cart. 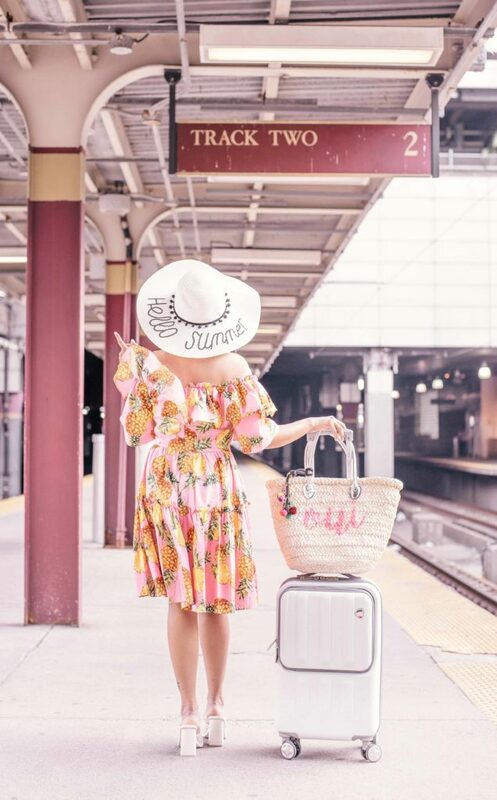 Tote bags ,sun hats (how cute is this one! ), and sandals are quintessential accessories for summer. 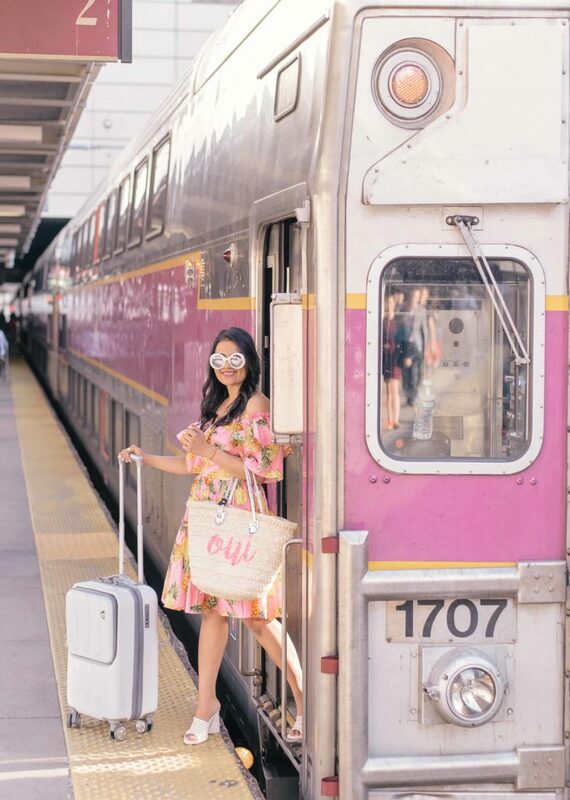 Pack them for a beach day, fill your tote with snacks for the road trip, or books and headphones for the flight! Love this one with tassels – Oui! For shoes, I loved these white mesh sandals on the website and as I am checking them now, only a few sizes are left. But don’t worry, there are so many cute sandals perfect for summer. And besides, there are always new styles to discover. Not to forget completing the look with a pair of trendy sunnies. I am obsessed with these cat-eye sunglasses that I snagged at such a great price. I loved shopping on the site and the in-store returns option is helpful when you aren’t sure of sizing. obsessed with your dress! you look so cute! Love the dress. And props for the apt location! 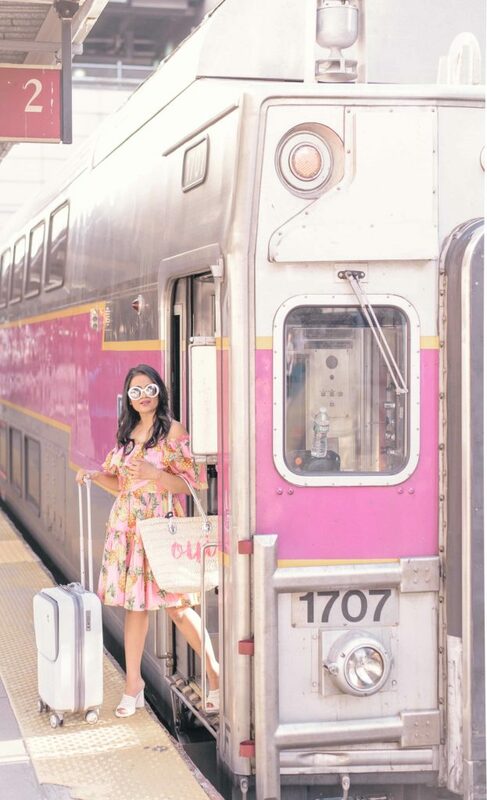 Babe, you look amazing on that pink floral dress! Loving the off-shoulder ruffled style, really chic and cute. Also, your strawbag is really completes the outfit! You are so sweet, Jess. Thanks so much for the sweet words! Neha- The dress is lovely but seems to be sold out. Any other alternatives ?